A kids friendly sandwich recipe. To prepare the paneer filling, heat oil in a pan. Add sliced onions, ginger garlic paste and saute for 2 minutes. Add sliced capsicum and mix it well. Add red chilly sauce, soya sauce, vinegar and salt if required. (Soya sauce and chilli sauce contains salt). Add the paneer cubes and saute for 2 to 3 minutes. Paneer stuffing for the sandwich is ready. Place the paneer stuffing on one slice. Spread some butter over the sandwiches before grilling. Place the sandwich in a sandwich maker and grill till crisp and golden. 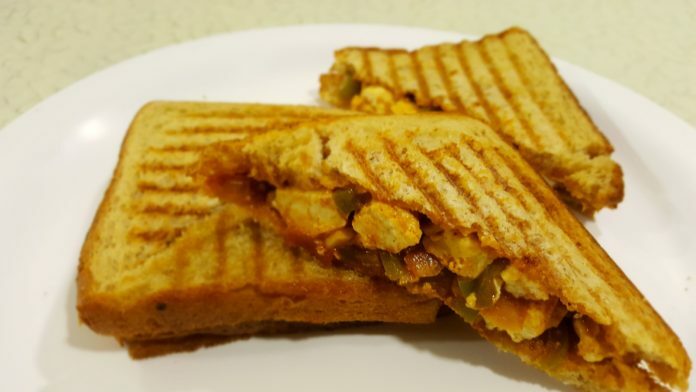 Remove and serve the hot grilled paneer sandwiches.